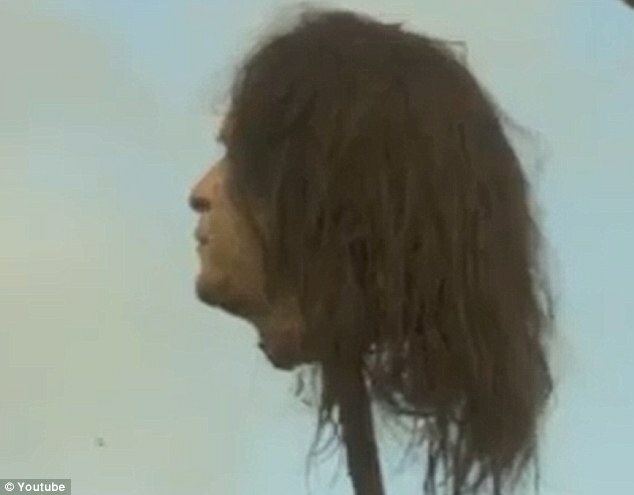 A long-haired prosthetic likeness of a head of a head of state adorns a pike in King’s Landing. Game of Thrones has sparked a feigned moral outrage because a prosthetic likeness of the head of President George W. Bush appears on a pike alongside Lord Eddard Stark’s, if only for a brief few seconds at the bottom left of the frame. Lèse-majesté only applied by law to the Office of Presidency for a brief period under the Sedition Act, which President John Adams happily supported. Section 2 of the Sedition Act made illegal any “false, scandalous and malicious writing” against the House of Representatives, Senate, or the President of the United States. In illiberal countries today and throughout mediaeval Europe, lèse-majesté (from Latin via French, “injured Majesty”) made mockery or insults against the Sovereign a criminal offence because the Sovereign’s person is inviolable. The symbolism of the evil Lannisters having killed honourable righteous men like Ned Stark (and apparently long-haired George Bush) notwithstanding, this bizarre little incident shows that by convention, lèse-majesté applies to the American president. I offered an explanation why Americans normally hold the Office of President in high esteem in “The Contradictory American Presidency” and would add this specific case to my general argument therein. Responsible Government means that Ministers of the Crown (the Prime Minister and Cabinet) take responsibility for all acts of the Crown (policies, expenditures, and decisions), which therefore allows the Sovereign to become politically neutral and a non-partisan, unifying figure. In this way, Responsible Government preserves the old doctrine of the inviolability of the Sovereign. The Prime Minister as head of government and his Cabinet take responsibility for all operations of government because the Sovereign merely implements their decisions, which makes any personal criticism of Her Majesty for the decisions of Her Majesty’s Government wholly redundant and severely misplaced. One commenter on the Daily Mail’s article wrote, “I think it’s funny – I doubt anyone here [in the United Kingdom] would object if it had been [Prime Ministers] Tony Blair or Gordon Brown! Lol.” This is probably correct: if Game of Thrones had displayed the head of a head of government – specifically, a British or Canadian Prime Minister – on a pike, any public objections would have been confined to a hyper-partisan fringe. However, if the head of Queen Elizabeth II were displayed on a pike, a widespread public backlash would indeed have occurred. This British commenter therefore overlooked that the President of the United States is an elected, executive head of state (and therefore acts as both the head of state and head of government) and that the American backlash derives from a reverence to the President’s role as head of state. That said, most Britons would not even think of putting the Queen’s head on a pike because they intrinsically understand that the Prime Minister and his or her Cabinet take responsibility for the policies and expenditures of Her Majesty’s Government. I find the public backlash misplaced, particularly because the episode in which the likeness of President Bush’s head on a pike aired last year and the DVD has been on sale for a few weeks. However, I understand why some Americans would object to that depiction, (though I still maintain that the presidential system lacks a non-executive head of state who can act plausibly as a unifying national figure). In any case, HBO and the producers of Game of Thrones should have anticipated such a negative reaction to their decision to boast about the prosthetic replica of President Bush’s head on a pike on the DVD commentary. As Queen Cersei told Lord Stark, “When you play the Game of Thrones, you either win or you die.” The above is true under a system of the law of rule or right of the stronger, where war and politics converge into one and where the King both reigns and rules as an absolute monarch. However, under a constitutional system and the rule of law that constrain executive action, “institutionalized uncertainty and dissent encourage the survival of both winners and losers. Presidents are indeed ill-suited to the Game of Thrones. This entry was posted in Parliamentarism v Presidentialism, Reaffirmation of, Responsible Government and tagged Game of Thrones, lèse-majesté, Lord Eddark Stark. Bookmark the permalink. I don’t think the reaction would have been meaningfully different if it had been either PM or Queen whose head was up there. Some would laugh, some would be insulted, most wouldn’t care. Not everything boils down to the differences between Congressional and Parliamentary systems, you know.